On and off for the past few months, I've been trying to regain and augment the Spanish I learned in school through an audio Spanish class I've been taking in my truck on the way to work. If you're ever in Saint Louis at 5:45AM and see a guy in a brown F150 groggily telling his radio "Desafortunadamente, he tenido que viajar a Nueva York la semana pasado" say hi because that's me... On top of that, a visit to [Carniceria Latino Americana] on Cherokee St. for a work lunch on Friday inspired me to make some tacos. We had couple pounds of "Pollo Asado Autentico" marinated chicken in the fridge, some Spanish Manchego cheese, and some avocados that needed to be used. Our chicken was pre-marinated (Trader Joes) but you can definitely make your own marinade like the "Mojo" recipe [here]. These were a nice change up to our weekly steak fajitas and we'll keep branching out with new combinations exploring Mexican cuisine. 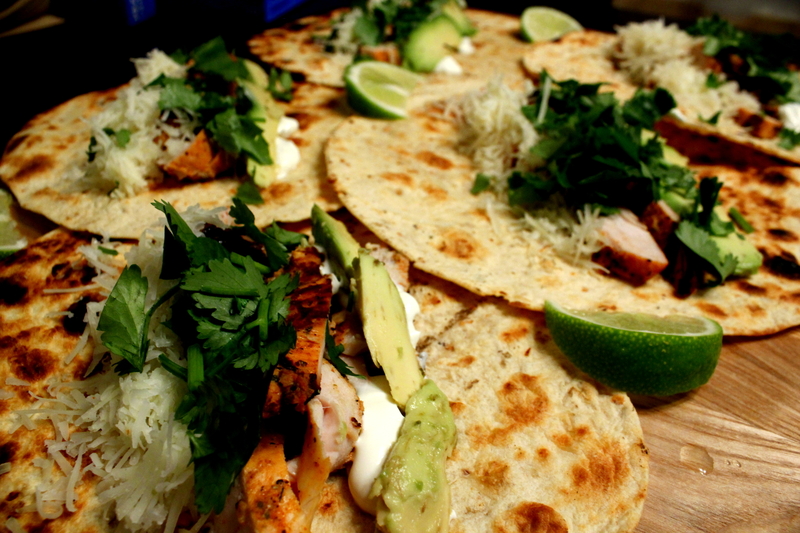 Pollo Asado tacos con manchego, avocado, y cilantro. 2. Chop cilantro, slice lime, shred Manchego. 3. Grill chicken until cooked through (10-15 minutes). 4. Remove and allow to rest. 6. Warm tortillas on grill. 7. Assemble taco, adding sour cream if desired, and top with lots of cilantro. 8. Squeeze lime over taco and enjoy.